Disruptive announcements are becoming a trend at Reliance Industries’ annual general meetings. Last year, RIL announced the commercial launch of free voice and data services in the form of Reliance Jio and this year, the company had once again created waves in the telecom market with the announcement of the JioPhone. As you would probably have read in a million places by now, the JioPhone is “effectively free,” with the company is charging a Rs 1500 refundable deposit for a minimum of three years. 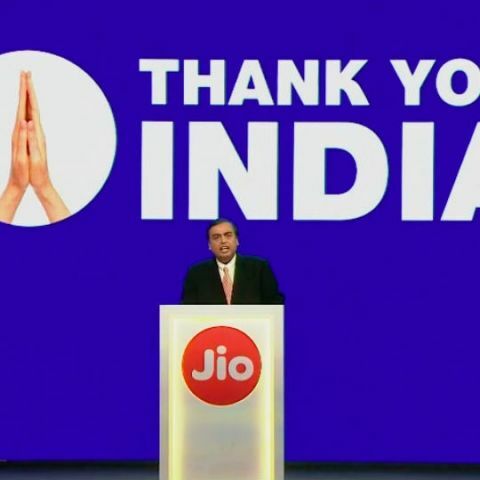 This means that to get their money back, Jio users will have to return the JioPhone after three years of usage, before which not refund will be provided. 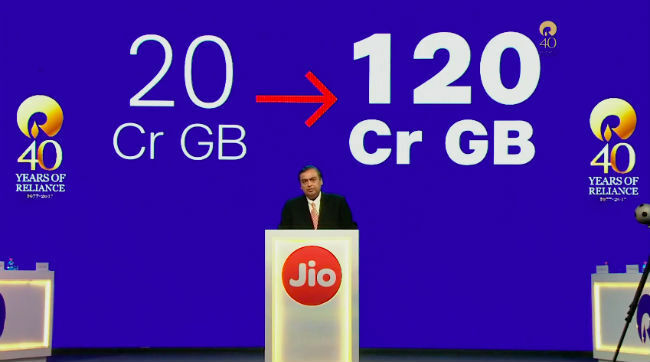 The Reliance Industries’ Chairman started the Jio presentation by saying that the company has managed to break several world record in a short period of time. 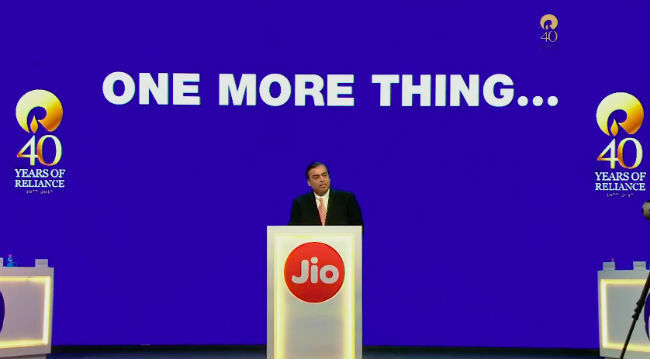 As per Ambani, one of Jio’s biggest achievement was to establish the world’s largest greenfield 4G LTE network. He also added that since its inception, Jio has managed to add seven customers every second of the day. 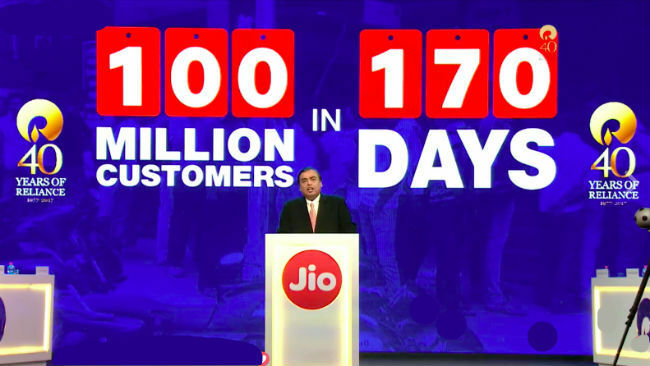 Reiterating Jio’s phenomenal rise in subscribers, Ambani said that 100 million customers were added to the Reliance Jio network in a total of 170 days. He added that VoLTE was a global unproven standard before Jio’s network launch and the company defied sceptics to create a network which now records 250 Cr voice and video calls daily. Taking note of India’s ballooning data consumption, Ambani said that since the launch of Reliance Jio, India’s data consumption has gone from .2 Exabyte to 1.2 Exabyte. 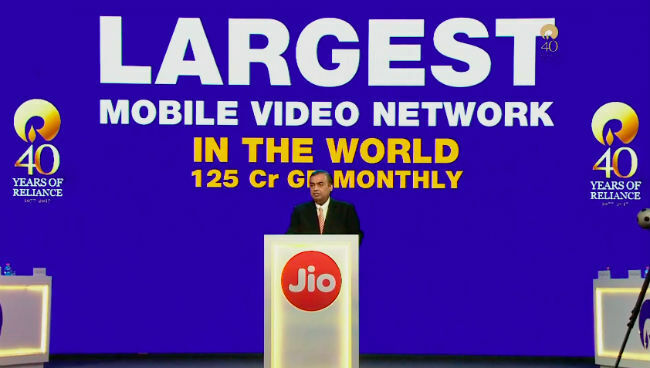 Jio is now the world’s largest mobile video network with 1.25 Exabyte data consumed per month. 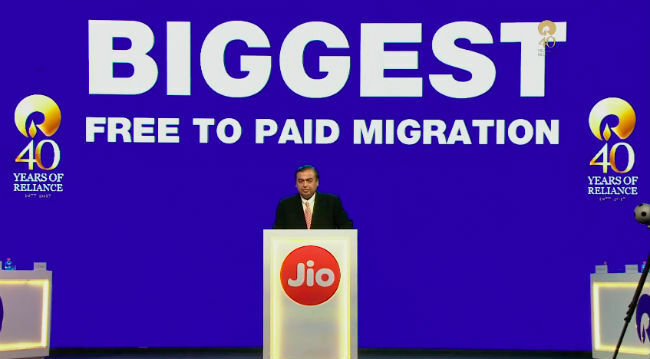 As per Ambani, Jio recorded the world’s biggest migration from a free network to a paid network. 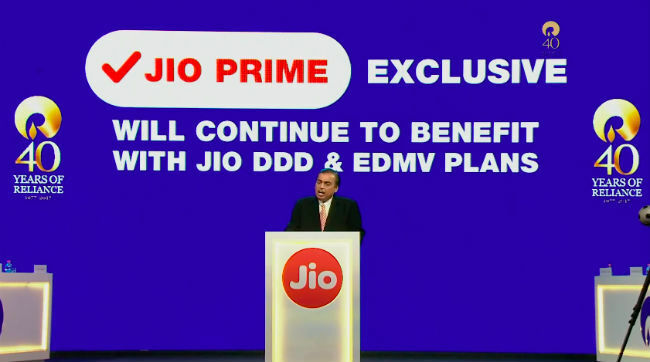 There’s good news for Jio Prime members as they will continue to enjoy exclusive plans and offers from the company in the future. Reliance Jio wants to be a force to reckon with in India’s rapidly evolving digital growth. For this, the company presented its 3-step plan to bridge the digital divide between feature phone users and smartphone users. 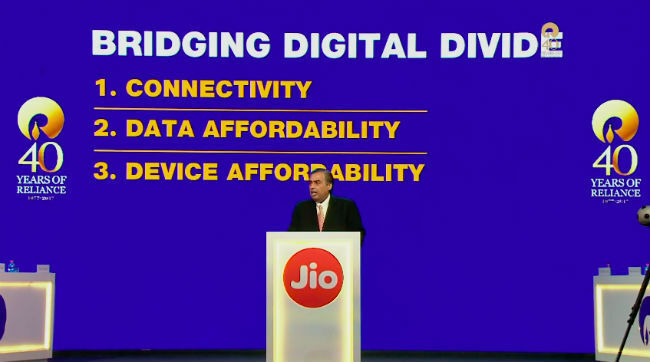 Jio’s 3-step strategy includes - better connectivity, data affordability and device affordability. 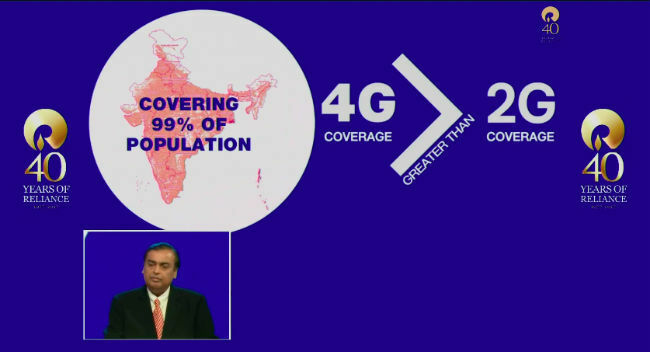 As far as better connectivity is concerned, Jio promised to cover 99 percent of India’s population with its 4G services, larger than the existing 2G network coverage. 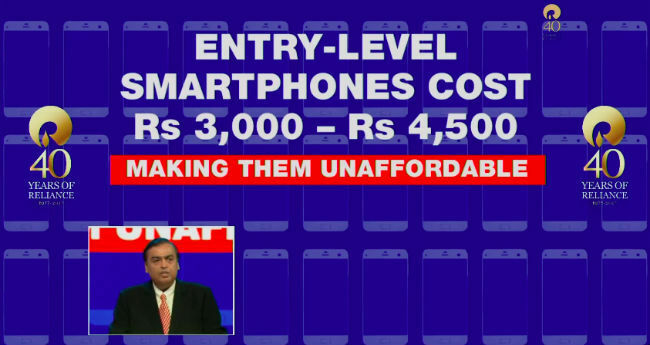 Ambani addressed the plight of feature phone users by acknowledging the fact that the cheapest 4G phones cost anywhere between Rs 3,000 to Rs 4,500, making them unaffordable for the masses. 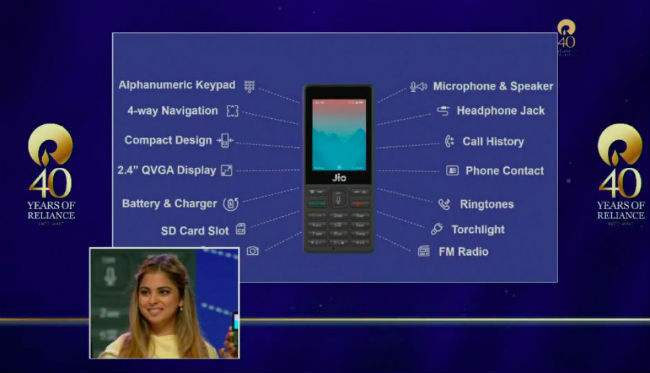 With that, a presentation for the JioPhone was kicked off! 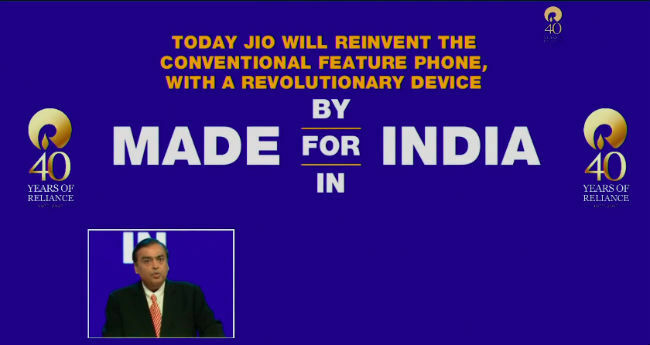 Ambani said that Jio has reinvented the feature phone with a revolutionary Made In India device, a nod to the PM’s Make In India initiative. This is the much awaited JioPhone. The smart feature phone comes with VoLTE connectivity and an intelligent voice assistant. 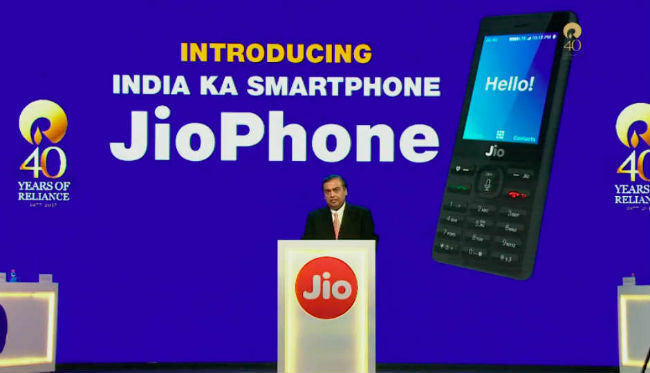 The phone sports a 2.4-inch QVGA display, an alphanumeric keypad with a 4-way navigation toggle, SD card slot, support for Jio apps, FM Radio, a dedicated torchlight button, a headphone jack and according to Jio, currently “the best speakers on a phone.” The JioPhone will also add NFC capabilities for digital payments through a software update in the coming months. We still don’t know the OS that runs on the JioPhone, but we believe it is a custom OS designed by Reliance Jio’s in-house engineers. Long-pressing 5 on the JioPhone will trigger a call to pre-fed emergency contacts, or even the police. With that, Ambani announced the disruptive tariffs on the JioPhone. 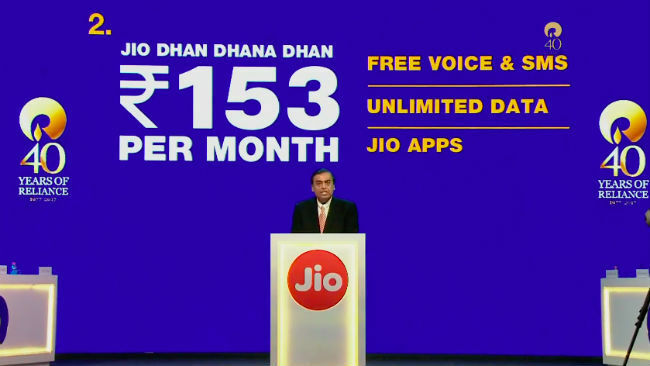 Jio users will get to use the JioPhone with unlimited calling, internet, messaging and Jio apps at Rs 153 per month. 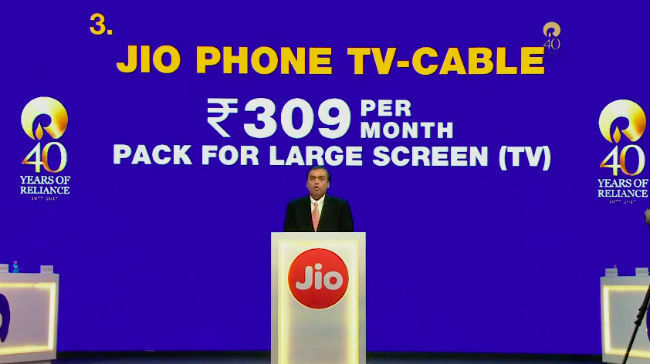 JioPhone users can even purchase a Rs 309 Jio TV cable to mirror content from their phones to their televisions. Users will also be able to take advantage of the Jio Dhan Dhana Dhan pack with this Rs 309 value. 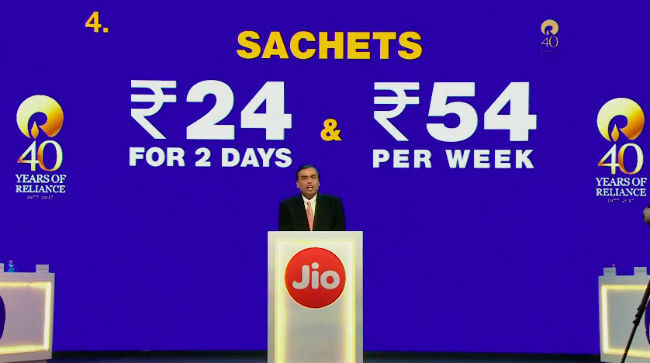 Apart from the Rs 153 pack, JioPhone users can also opt for smaller sachet packs with unlimited calling, data, Jio apps and SMSs at Rs 24 for 2 days, and Rs 54 for a week. 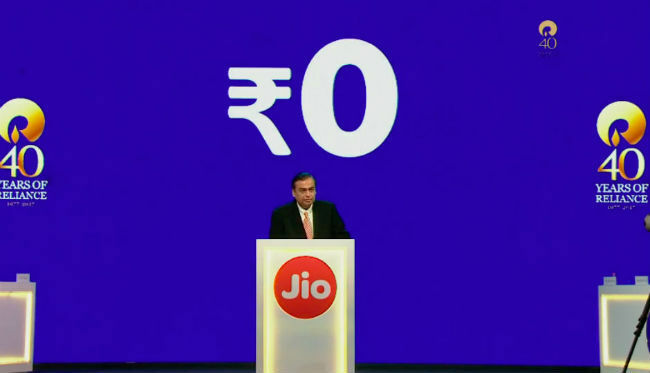 The price announcement for the JioPhone was revealed right at the end. Ambani borrowed a leaf from Apple’s event handbook by saying that there’s “One more thing” left to announce. 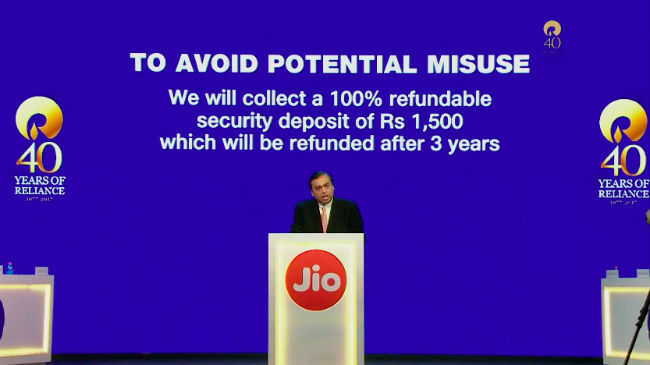 Reliance Jio will charge Rs 1500 as a one time security deposit which will be refundable after 3 years on the return of the device. Good curveball to throw Jio! 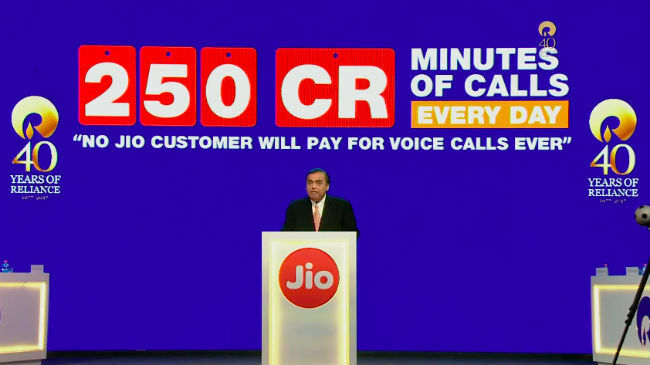 The Rs 1500 deposit will sit flush in Jio’s accounts earning a healthy interest. Jio expects to sell 5 million JioPhones per week after the launch of the device. 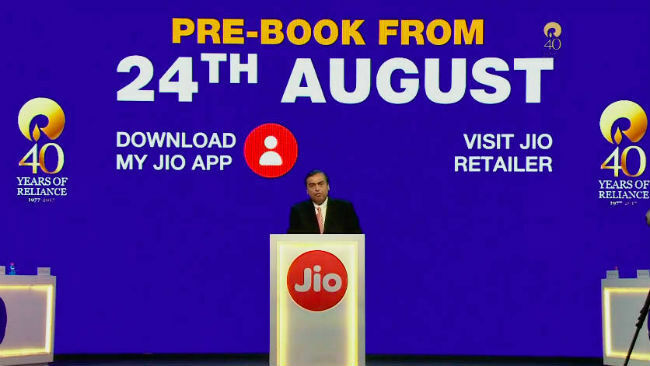 The JioPhone will be available to pre-book for all starting August 24. Those interested can pre-book the device through Jio retail stores as well as the My Jio App. 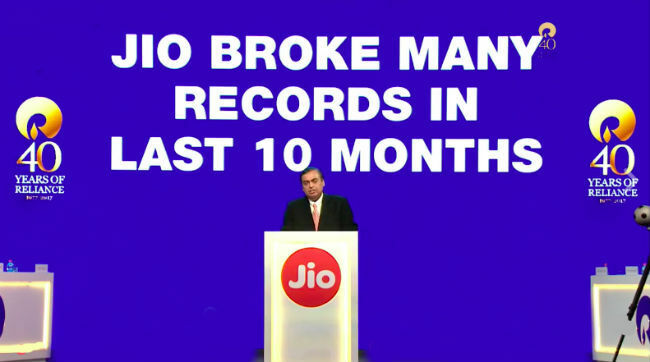 With that, Ambani concluded the Jio announcements. 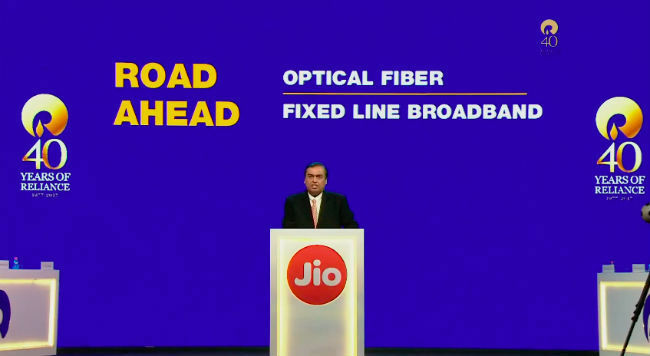 Unfortunately, we did not see a roll-out for the Jio GigaFiber, but Ambani promised that it’s coming soon. which is the best antivirus Norton, Quick heal, Kaspersky, Macfee Antivirus?? Xolo q1010i at an scale of 10 by Digit experts is?